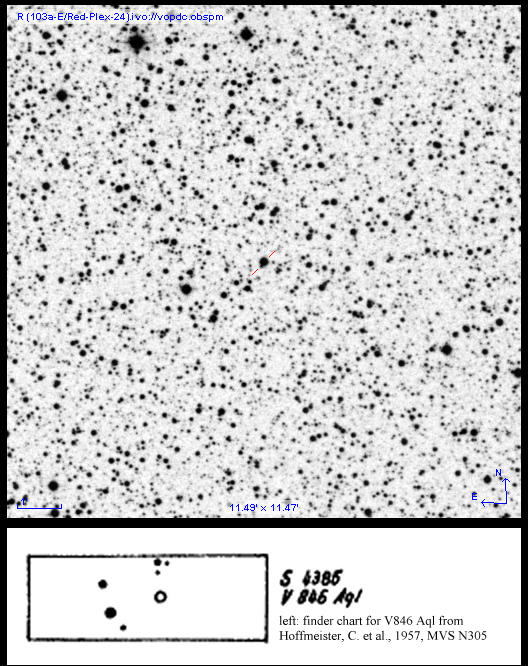 V846 Aql was discovered by Hoffmeister (1949), who assigned it number S 4385 in the series of variable stars detected at Sonneberg Observatory and identified it as a Long Period Variable with a magnitude range of 13–15 mag (p). The star was studied in more detail by Ahnert-Rohlfs and Götz (1952), who refined the magnitude range to 13.3 – < 16.1 mag (p), determined a period of 170 days and gave an epoch of maximum at JD 2429459 (July 14, 1939). Hoffmeister et al. (1954) retained these elements and listed the star as a Mira type variable, adding times of maximum at JD 2431326 (E11) and JD 2431670 (E13), stressing that maximum E0 (here given at JD 2429260) was based on only one observation. Elements from Ahnert-Rohlfs and Götz (1952) have also found their way into the General Catalogue of Variable Stars (GCVS; Samus et al., 2007–2013). V846 Aql was inspected by the authors during an ongoing search for new R Coronae Borealis (hereafter R CrB) variables because of its inclusion in the "Catalogue enriched with R CrB stars" (Tisserand 2012). From an investigation of data from various sky surveys, we conclude that there is no Mira variable with the indicated range at V846 Aql's position, although the identification based on the chart in Hoffmeister et al. (1957) is correct (cf. finding chart). The positional identification has also been confirmed by Kinnunen and Skiff (2000). HJD (Max) = 2453508 + 36.79 x E.
Discrepant magnitudes can be found in the literature which indicate that the star goes much fainter (e.g. V = 14.45 mag (YB6); V = 15.12 mag (NPM2)). These faint magnitudes are in agreement with the minimum value of < 16.1 mag (p) listed by Ahnert-Rohlfs and Götz (1952). Additional support comes from an investigation of Sonneberg plates by one of us (Klaus Häussler) that show long-term mean magnitude changes consistent with the larger range. V846 Aql was investigated on 214 plates (plate size: 30×30cm; emulsion: ORWO ZU2) taken with the 40cm astrograph of Sonneberg Observatory in the period from JD 2429460 until JD 2450281. The brightness estimates were done using the Argelander method; the magnitudes of the chosen comparison stars are B magnitudes taken from the USNO-A2.0 catalogue. We assess the uncertainties of the estimates to be on the order of ±0.3 mag as the star is situated near the edge of the photographic plates, in particular on plates from JD 2429460 to JD 2432000. Results are shown in Figure 2. In addition to rather ill-defined pulsational variability, there is evidence of a long-term mean magnitude change of the order of 2 magnitudes that seems to take place during the whole timespan of Sonneberg plate coverage (~20 000 days). In order to provide an overview of V846 Aql's behaviour that accomodates all available data, we have shifted Sonneberg plate estimates to the V scale by using the B–V index derived from APASS observations. While this has to be regarded as an approximation, it resulted in a coherent light curve illustrating the star's long-term light changes (cf. Figure 3). From this, we have also tentatively derived a minimum magnitude of 15.1 mag (V) for V846 Aql. It is important to notice that the amplitude of the pulsational variability has obviously decreased over time. At the beginning of Sonneberg observations, the amplitude has apparently been much larger than what is found in recent sky survey data, which lead early observers to classify V846 Aql as a Long Period Variable of Mira type. As red stars are usually registered much brighter in the unfiltered ROTSE-I band, the small discrepancy between the mean magnitudes from NSVS and ASAS-3 is a first hint at V846 Aql's non-red nature. Furthermore, near-infrared magnitudes (J = 10.18 mag; K = 8.80 mag) from 2MASS (Skrutskie et al. 2006) seem too faint for a red star with an average V magnitude of 12.6 mag. Colour indices from 2MASS (J–K = 1.38) and APASS (B–V = 1.09) give evidence of infrared excess, which is also supported by the fact that V846 Aql shows similar mid-infrared properties to R CrB stars (cf. Tisserand 2012). At this point, without further photometric and spectroscopic studies, we are unable to classify V846 Aql conclusively and tentatively allocate it to the class of semiregular variables of type SRD on grounds of the available data. While infrared excess and semiregular pulsations are characteristic of R CrB stars, the star's complex light curve does not show the typical fadings and recoveries of this kind of variable. The long-term mean magnitude shift observed on Sonneberg plates is further evidence against a classification as an R CrB star. There is a certain resemblance of V846 Aql's behaviour to the light variations observed in RVb variables, a subtype of RV Tauri variables which shows long-term mean magnitude changes superimposed upon the pulsational behaviour. Unlike V846 Aql, RVb stars usually show different depths of minima but there are exceptions to this rule, like e.g. IW Car, whose minima are not to be differentiated in ASAS-3 data. However, the long-term mean magnitude shift in V846 Aql is several times longer than a typical RVb cycle; the only two maxima on record (if maxima they are) are spaced by about 20 000 days. It is interesting to note, though, that three new RVb stars were found during our investigations of R CrB candidates from Tisserand (2012). Obviously, mid-infrared properties of this type of variable are similar (infrared excess). Data for the newly discovered RVb stars are given in the Table; more details are available via the International Variable Star Index (VSX; Watson et al. 2006). The behaviour of V846 Aql is also reminiscent of the long-term mean magnitude shifts found in K giants by an investigation of Harvard plates using data from the DASCH project (Tang et al. 2010), although the observed range in V846 Aql is larger. Tang and collaborators propose dust formation or short-term evolutionary processes as underlying causes of the observed light variations. Some dust-related phenomenon seems promising as a cause of the observed mean magnitude shifts in V846 Aql, which would also agree with the star's inclusion in Tisserand's list (Tisserand 2012). Further photometric and spectroscopic studies of V846 Aql are encouraged. Table - Essential data of the new RVb stars discovered during an investigation of candidate R CrB variables from Tisserand (2012). Positional information was taken from UCAC4. Magnitude ranges and periods have been derived from an analysis of ASAS-3 data, which in the case of IRAS 15236–4644 and 2MASS J18055049–1513016 have been corrected for light contamination from nearby companions. The minimum magnitude of 2MASS J18055049–1513016 was taken from GSC2.3. More information is available via VSX. Acknowledgements: This publication has made use of the SIMBAD and VizieR databases operated at the Centre de Données Astronomiques (Strasbourg) in France.